After a week when we all thought summer was on its way the weather gods decided otherwise and at Bethlehem, renowned for being one of the coldest places in the country lows of minus 4 with a high of 9 and a wind gusting at 37 Km/ph were forecast. The forecast turned out to be spot on. The show as the saying goes must go on and the field was filled with its customary tents and marques offering goodies of all kinds and those traders that sold jackets, beanies and gloves did a roaring trade. Opening the show was the parade of emergency vehicles which included two brand new state of the art trucks that will in future be available for smaller shows where no suitably vehicles are available. Jointly sponsored by Haz Quip and Capital Sounds the presence of these vehicles will no doubt lead to safer shows. 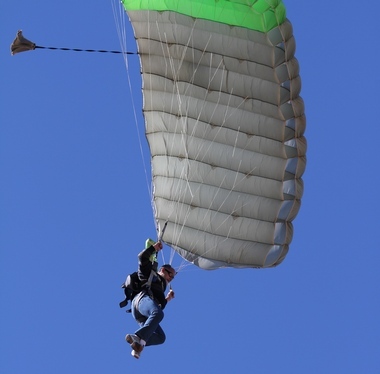 A team of extremely brave Skydivers braved the icy conditions and despite the strong gusting wind all landed safely along the crowd line. Freestater Frank King in his RV7 was the first act to take to the sky and the crowd numbering about 3,000 was treated to a short spirited display in the popular home build. 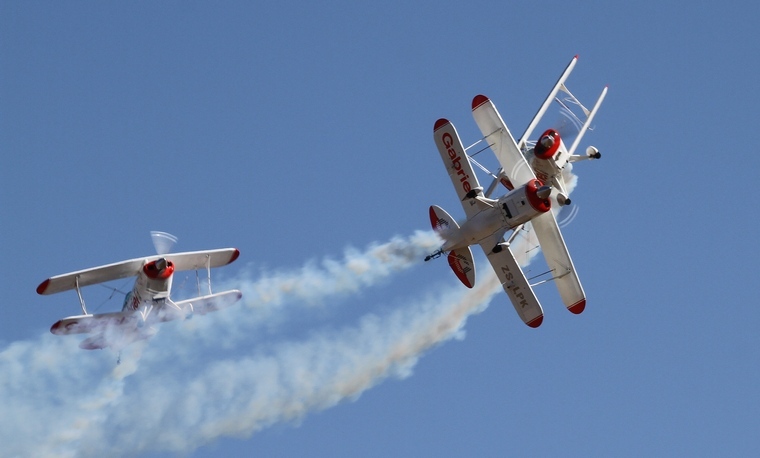 Next up was current SA Aerobatic Champion Nigel Hopkins in the MX2 and he had the spectators in awe. Nigel had just been promoted the Chief Training Officer at South African Airways. 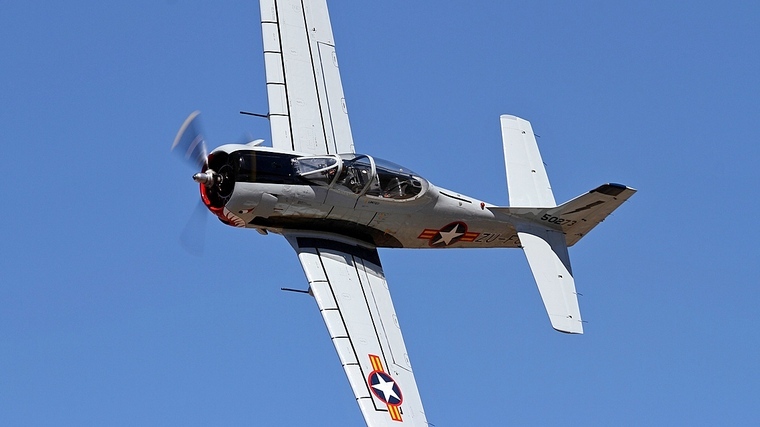 Warbirds are always crowd favourites and the T28 Trojan with its distinctive sound was displayed brilliantly by Larry Beamish. Next up was the older brother of the Trojan, the Harvards of the Eqstra Flying Lions who flew a tight display in difficult conditions. NAC's Kodiak made its first appearance at Bethlehem and Francois Joubert displayed it to perfection, showing the full flight envelope of this remarkable aircraft. It probably wasn't the day for open cockpit flying however Johnny Smith braved the conditions and showed why the Tiger Moth is so revered. At one stage during his display it almost seemed as if it was just hanging stationary in the sky as he flew into the wind. Brad Bennets and Elis Levine it their Mazda sponsored Extra 300 performed their �the joy of motion� high performance and high G factor display. Following the Zoom Zooms was Mike Weingartz in Dawid Laas's Impala MkI. ZU-Imp was the first of twenty MkI's to be taken into service by the SAAF and the only one in privately owned. 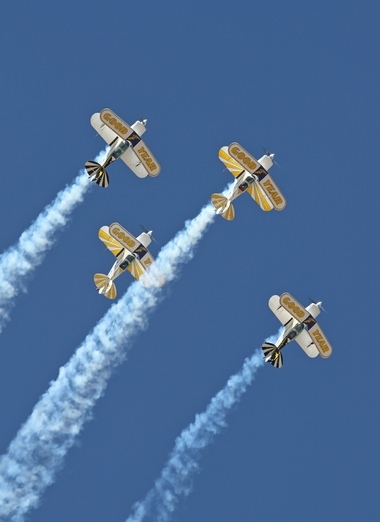 The Goodyear Pitts Special filled the sky with action in a display that always seems to have a new element added. Mustang Sally flown by Menno Parsons is a crowd favourite and his high speed display did not disappoint. 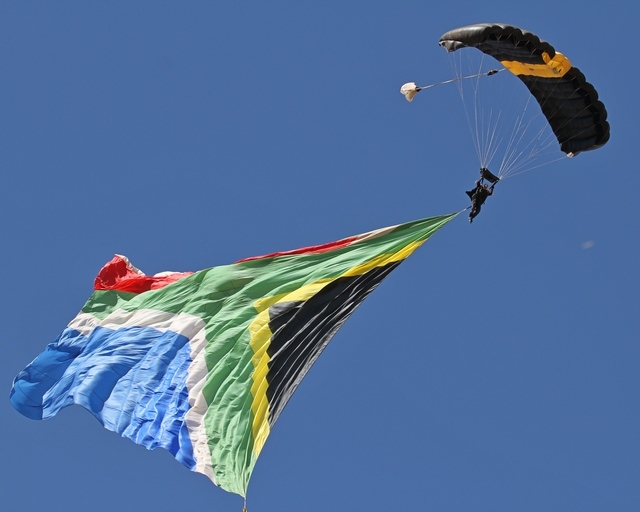 A fitting tribute was paid to Odette Prinsloo who so tragically lost her life in the Cirrus accident at Lanseria. Odette who hailed from Bethlehem and was a member of the club got her there. 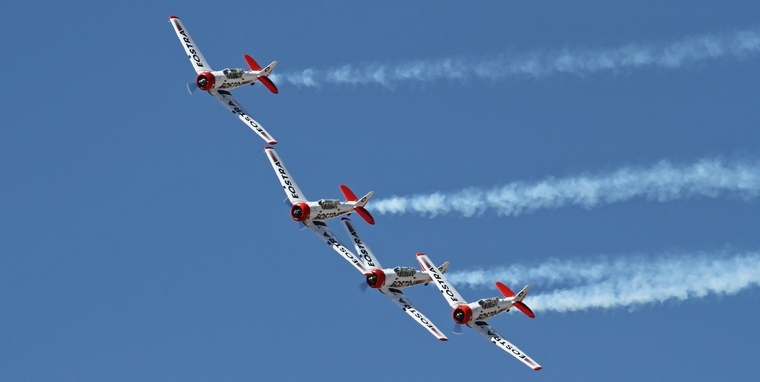 The missing man formation consisted of four Harvards and a DC3. 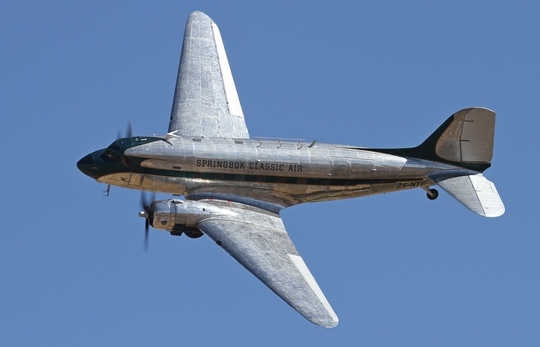 Laurie Raath and Piet Niewenhuizen then did a solo display in the Springbok Classisc Air DC3. 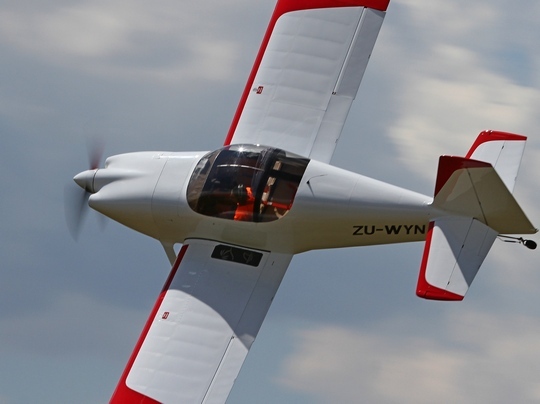 ZS-NTE will celebrate her 70th birthday on 24 Spetember. The gates to the apron were opened during the lunch break and the spectators were allowed airside to view the aircraft from up close. After lunch the skydivers re-opened the show. 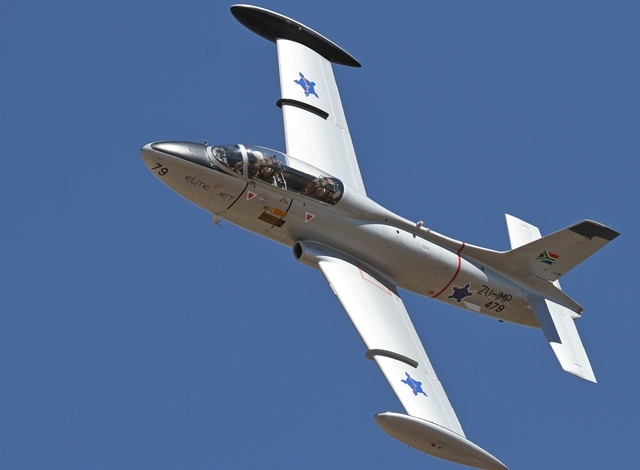 Charles Urban in the L39, ZU-TEE then took to the sky in the second jet display of the day. Then it was the turn of the five ship Gabriel Wings Pitts Special whose precision display of formation flying thrilled those brave enough to have despite the cold and wind have stayed. 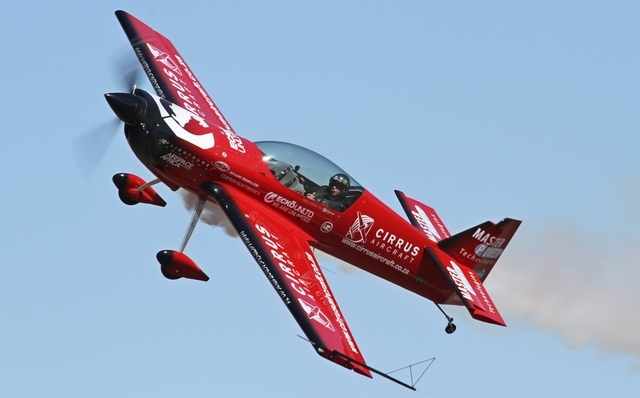 Nigel in the MX2 did a second display followed by Team Triton Express in the Extra 300 making their Airshow debut. Flown by Larry Beamish and Charles Urban they are sure to become favourites. Another Airshow debut was the Sbach of Johnnie Smith who painted crop circles in the sky. 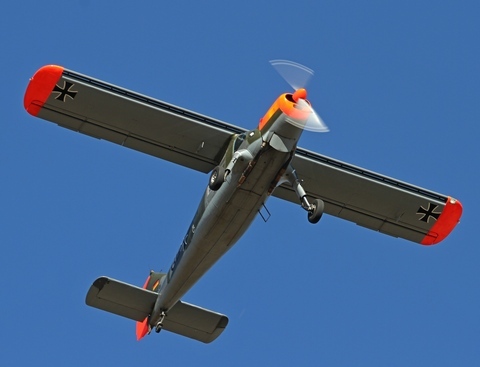 Slow was the way Henri Westerman did it in the Dornier 27. 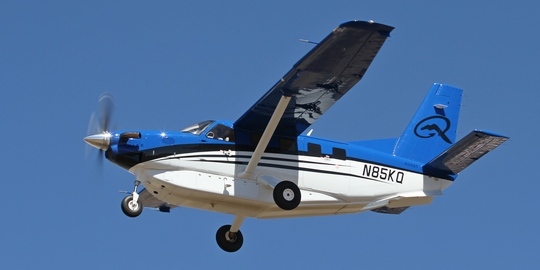 The 27 is one of only two flying in the country and the Dornier with the lowest hours in the world. To Capital sounds, Derek O'Conner and all who were involved congratulations on a well organised show with some exciting display and aircraft.